Home » All Posts » How do chemicals get into our bodies? How do chemicals get into our bodies? There’s almost nothing that annoys me as much as chemophobia; the belief that chemicals – especially synthetic chemicals – are inherently bad. I think because people don’t understand them. It’s increasingly powered by social media. Chemicals- Chemicals are essential building blocks for everything we know. They’re naturally occurring, synthetic or combinations thereof. We’re all concerned what they do to our body. And also what our body does to them. How do chemicals get into our bodies? Through the skin, lungs, and by what we eat and drink. First it has to be absorbed. The chemical is then distributed by the blood- and this is how the body can change the chemical to get rid of it (biotransformation or the modification of chemicals by enzymes). We can eliminate chemicals- mainly through our liver and kidneys. These processes: absorption, distribution, biotransformation, and elimination are called toxicokinetics. What we’re left with is the biological effective dose that has the potential to cause changes in the cell. Initially, the changes are molecular. The more the molecules are changed, the more it changes the biochemistry of the cell and how it functions. With cell toxicity, can come organ failure. Toxicodynamics is the potential molecular biochemical and physiological effects that a chemical or toxin may have on our biological systems. The bottom line is when we’re exposed to a chemical, the effect is dependent upon the dose. The body handles chemicals on a case by case basis on a molecular level, not caring if it came from Mother Earth or a lab, and generally has the mechanisms to eliminate them, unless it’s something like lead, where it can be stored in the bone. When did you begin to be scared? 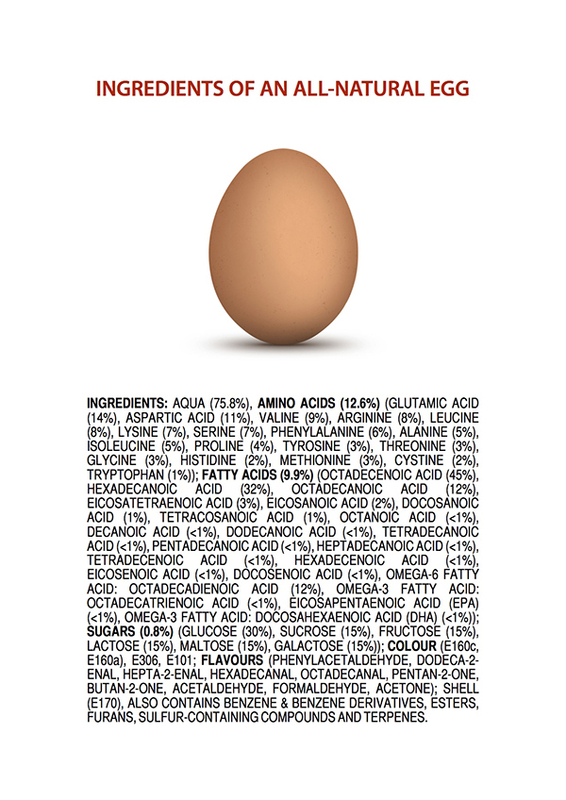 Take a look at the chemical makeup of an egg. Nothing to be scared about!